In today’s globalized world, the value of a college degree has skyrocketed. By 2020, approximately 65 percent of all jobs in the economy will require an education beyond high school. Three of the fastest-growing industries—STEM, healthcare, and community services—all require postsecondary degrees and training. However, college attendance and graduation rates in the United States have not kept up with the increasing demand. The same study estimates that the American economy will have 5 million jobs left unfilled due to a lack of qualified workers with postsecondary degrees. In response, programs known as college promises have emerged across the nation over the past few years, seeking to increase college access for lower-income students. In America, college enrollment rates have been steadily decreasing over the past few years despite the fact that high school graduation has been rising. One likely contributor is the ever-escalating costs of attending college. In particular, poorer students are more affected by the rising costs than more affluent students. As such, college enrollment rates for low-income students has dropped 10 percentage points over the last decade. In 2013, only 46 percent of low-income students enrolled in postsecondary education. Furthermore, low-income students are three times more likely to attend for-profit schools, which charge higher tuition fees and yield far worse results than traditional higher education institutions. Historically, Pell Grants have been the primary form of federal support for the lowest income students to attend college. However, the program is in jeopardy as the recent spending bills proposed in Congress sap significantly from Pell Grant reserves. As such, the opportunity for the poorest students in the country to attend college continues to dwindle. This increasing gap in college access between lower income and more affluent students only serves to perpetuate the worsening wealth gap between the poor and the rich. Wealthier students with college degrees have access to better-paying jobs, while those without degrees are more likely to receive lower incomes over their lifetime. This creates a vicious cycle trapping poorer families without any means of climbing the socioeconomic scale. As more and more jobs require university degrees, low-income students are left behind. What are college promise programs? College promise programs are an innovative strategy implemented to improve college education access for students in the United States. While traditional forms of financial aid award money only to students who meet certain income thresholds or attain academic success, college promise programs, also known as place-based scholarships, typically offer financial aid for students who reside in specific areas to attend a local community or technical college. Their goal is to increase college access in specific geographic locations. The source of their funding varies by program, from state-funded to corporate support to rely on individual donors. The Kalamazoo Promise was the first prominent promise program in the United States. Initiated in 2005, it provides financial support for students who attend schools in the Kalamazoo Public Schools (KPS) school district in Michigan. The program awards financial aid based on how long a student had been enrolled in a KPS school: those enrolled continuously since kindergarten are awarded more money. No other factors like financial need or academic achievement are considered. As a result of the program, college enrollment of KPS graduates has increased by 34 percent and college graduation rates by 12 percent. Beyond benefiting college access, the program has also encouraged pre-college preparation. Students eligible for the program demonstrate fewer disciplinary incidents, improved high school GPAs, and higher ACT scores. Since the implementation of the Kalamazoo Promise, enrollment in KPS schools has sharply increased. By the end of 2014, the program has reached over 1400 students and provided more than $61 million in aid. The success of the Kalamazoo Promise has inspired a multitude of similar programs across the nation. There are currently an estimated 239 promise programs in the United States. Many states, such as Washington, Tennessee, Oregon, and recently California have implemented state-wide promise programs. Cities with city-wide programs include Pittsburgh and Syracuse. By reducing an important barrier to access to higher education, college promise programs pave the way for low-income students to enroll and graduate university. 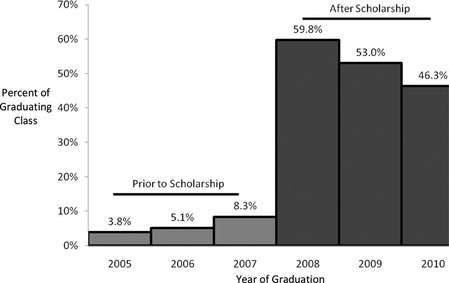 Several studies have demonstrated significant increases in college enrollment of low-income students after the implementation of a college promise program. Additionally, those students have a higher retention rate than low-income students without access to college promise programs. Furthermore, college promise programs have a greater impact on college attainment for low-income students than traditional financial aid resources. This suggests that promise programs motivate low-income students to consider college beyond simply financial aid. One possible cause could be that promise programs emphasize financial assistance for all students, irrespective of academic ability. Another explanation may be that since many promises are more heavily promoted over a longer duration, they may create beneficial alterations to a student’s college aspirations. Several college promises incorporate elements of college preparation. Many have outreach components to the lowest income families, and most provide information and assistance to guide students through the college application process. Moreover, college promises promote early awareness of ensured financial aid. The earlier that students are confident that they will have the financial backing to enroll in college, the more likely they are to be better prepared for college, such as by taking more rigorous courses in high school and attaining higher GPAs. Another finding indicates that college promise programs increase the self-esteem of low income and minority students. Promise programs provide information and financial support in the form of a cohesive package rather than as several dispersed pieces. Additionally, these programs target specific segments of the student population. This more personal approach helps student grapple with the idea that they themselves are college material. Beyond helping low income and underrepresented students attain college success, place-based scholarships also assist the local growth of poorer neighborhoods. Studies have found increases in the demand for houses in areas with college promise programs. For instance, property values in Syracuse rose after the adoption of the Say Yes in Syracuse college promise. In addition, home prices in areas affected by college promise programs rose on average 7 to 12 percent within three years. Although the increase was more pronounced in areas with high-quality primary schools, low income and urban neighborhoods benefited from significant spillover. Furthermore, the presence of place-based scholarships benefits local labor market. Evidence demonstrates that such programs reduce out-migration in the areas with promise programs. The Kalamazoo Promise had the net effect of increasing the population of the affected area by 1.7 percent, stemming primarily from households with school-age children. This boost in the local working population led to the creation of approximately 1,900 new jobs in the region. Across the nation, college promise programs have proliferated as an innovative method of granting low income and underrepresented students the opportunity to achieve a college degree. However, variations in the implementations have yielded mixed effectiveness. Seeing as these are relatively new strategies, more research is necessary to determine the most optimal way to utilize these programs. Nevertheless, with more support, college promises hold the potential to revolutionize financial aid to poorer students.